Laura Gallardo’s practice focuses on the legal needs of small businesses and their stakeholders. That comes naturally to Laura since, from an early age, she was exposed to the complexities of running small businesses owned and operated by her parents. That hands-on, front-row experience gives her perspective from both sides of a legal transaction. She has an edge in anticipating the risks and complexities of a wide range of business challenges. More importantly, that experience has bred in her both the instincts and the desire to help particularly the young entrepreneurs whose inexperience may cause them to stumble into a law office. 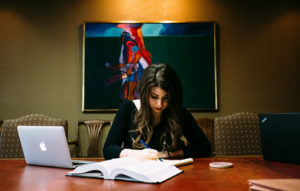 While helping small business owners has been Laura’s general legal passion, her preferred focus is upon complex business disputes. Whether cases sport a thousand pages or a million, Laura has developed unique skills in receiving, cataloging, organizing, and coding a mass of documents to facilitate finding that critical needle in the endless haystack of documents. Laura’s experience arises from a number of document-intensive cases in which she has overseen the retrieval, review, and production on both sides of the docket. And, of course, in trial it has fallen to her to organize the critical exhibits from all sides for quick retrieval before the court or jury. It has been high-pressure experience. Her own personal modifications to standard systems has also contributed to speedy access by other members of the trial team, whether in-house or from co-counsel’s staff of attorneys, paralegals, and associated courtroom professionals. She has received compliments from federal and state court judges occasionally unfamiliar with the particularities of certain digital discovery processes. Her expertise and diplomatic touch leaves even opposing counsel and the court at ease in discussing digital complexities, fair and workable discovery standards and processes, and protective orders that simplify rather than obscure discovery objectives. The resulting efficiencies typically save the client money and the court, time. While the firm’s team of lawyers offer a wide range of practice experience, Laura’s primary focus expands from her discovery expertise into strategic discovery planning, litigation cost control, and risk management. Perhaps her most valuable attribute, perceived by the lawyers and staff in our firm and that of co-counsel, and by court staff, is her dependability. If she says it will be done, it will be. That reflects her small-business background where efficiency, honesty, and productivity are most essential to success. And, she returns calls. Laura, a Sherman local, graduated from Sherman High School. Then after graduation, she managed to push four years at Austin College into three, during which she met her future teammates at Sanders, Motley, Young, & Gallardo, since those three taught business law as adjunct professors at Austin College. Pushing forward, she secured admission to Baylor Law School, starting even before the actual graduation at Austin College. Her B.A. degree followed about a month after starting Baylor Law School. Laura also graduated from law school early, sitting for (and passing) the Texas Bar Exam at the age of twenty-four. Don’t let Laura’s youthful looks fool you. Knowing her way around problems and problem-solving was baked in early from her family business experience, proving skills that have only sharpened through her legal education and client case experience. Laura serves on the board and chairs committees for Sherman Service League, and other charitable efforts which raise funds and food for local Grayson County charities. For example, Laura also serves on the Board for United Way and Belden Street Montessori School. While Laura and her fiance’ are planning children down the road, until then a small cadre of felines serve as a place-holder: Yadi, Samus, and one cleverly tagged as “Kitten”.